It's time to freshen things up around here. I've left this portfolio site withering in the cobwebs for seven years while I pursued a fantastic career in interaction design, simultaneously put a spouse through a masters in business administration, and played the part of a full time parent. Alicia Key's "Superwoman" was played a few times when it was insane. It was busy, but we've survived, grown stronger and I'm enjoying the extra time to spend on personal projects. My to-do list has a bucket for "personal projects" that are 895 days past due and it's time to tackle them. With a new site, I wanted to update my logo and personal image. I hired a photographer, Laura Bunker, to add some personal photos to the site and social media. She was great to work with and I loved the shots she was able to capture. More on those later. I also identified with a new mark, the sego lily. I work and live in Utah, and it is the state flower. It has personal significance and I liked the symmetrical look. 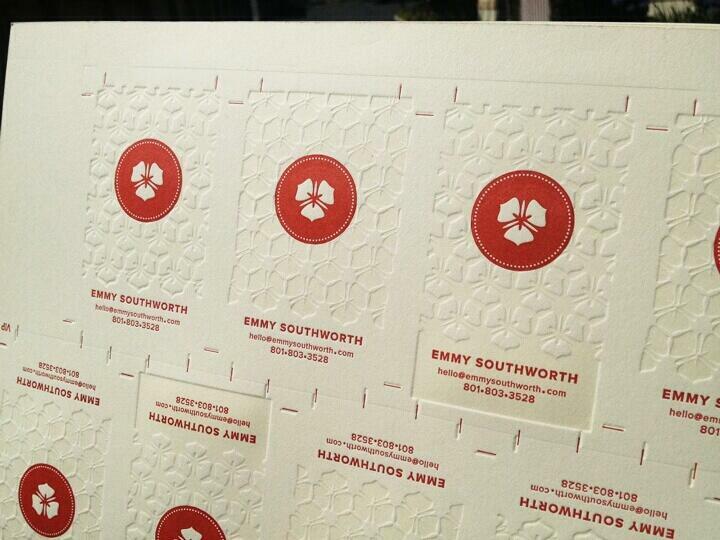 My brother lent a hand with his Vanderbilt proofing press, taking my vector designs into a handcrafted business card. The repeating pattern of sego lilies look a bit like Boba Fett, if you stare at it long enough. An extra touch of geekiness.